These days the temples Beijing builds tend to be modern skyscrapers honoring the gods of business, but this ancient city also features many temples reflecting a more spiritual past. Here are some of the best to see during your visit. With archways and five main halls, revolving prayer wheels, colorful glazed tiles, statues of Chinese lions, and Mongolian, Manchu, Tibetan, and Chinese decoration, Beijing’s Lama Temple is the most magnificent Buddhist temple in the city. Don’t miss the 60-foot (18-meter) statue of Buddha, said to be sculpted from a single sandalwood tree. Situated in Temple of Heaven Park, this popular UNESCO-listed temple—a stop on just about every Beijing tour—was originally built during the Ming and Qing Dynasties as one of the city’s eight ancient altars. The Taoist temple was used in ceremonies to ask the gods for good harvests in the fall and a prosperous new year on the Winter Solstice. Tanzhe Temple ranks among the city’s oldest and largest temple complexes, though many of the structures you see today date back to the Ming Dynasty and Qing Dynasty. Set amid the forested hills west of central Beijing, the temple is especially scenic in spring when the magnolias are blooming. 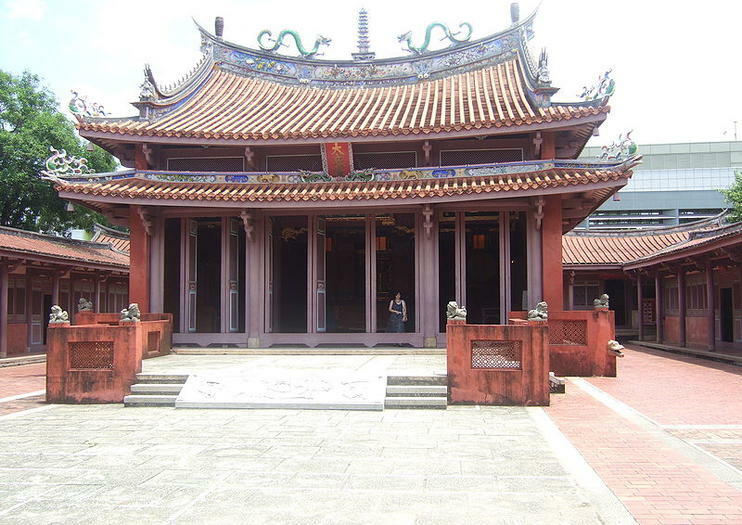 The second largest Confucius temple in China dates back to 1302. A quiet sanctuary away from the busy streets, the restored main hall of this temple contains a statue of the sage Kongzi (Confucius). Nearby is the Imperial College, built in 1306 by the grandson of Kublai Khan to teach Confucianism. Miaoying, also known as the White Stupa Temple, is best known for its collection of thousands of Tibetan Buddhist statues. It’s also home to the tallest Tibetan-style pagoda in China, set amid one of the city’s traditional hutong neighborhoods. Discover the magnificent monuments and cultural highlights of Beijing on a full-day private tour of the city. Accompanied by a knowledgeable private guide, visit impressive landmarks like Tiananmen Square and absorb the ancient majesty of UNESCO World Heritage-listed sites like the Temple of Heaven and the Forbidden City. Satisfy an appetite for authenticity with a locally prepared Chinese lunch and join locals in ancient customs like tai chi. Enjoy the freedom and flexibility of a tailored itinerary and receive the undivided attention of your guide on this private tour. Immerse yourself in the beguiling city of Beijing during a full-day tour of the city’s most significant historical sites. Visit legendary landmarks like the Forbidden City; absorb the sacred ambience at the Temple of Heaven; and marvel at the structural beauty of Tian’anmen Square. Accompanied by a knowledgeable guide, delve into the rich history of the city and discover one of the oldest cultures on earth. Convenient round-trip transportation from your Beijing hotel is included on this tour. Take a private customized tour of Beijing that includes transportation, and have the option to go with a knowledgeable local guide or travel on your own. You'll have a private vehicle with a professional driver, and a customized itinerary planned prior to arrival. A tourist map and itinerary suggestions are included to help you decide how to spend the day. If something captures your attention en route, stop and check it out. The half-day tour can visit top city attractions, while the full-day itinerary allows time to visit the Great Wall and other key sites. Discover the best of Beijing during a fascinating full-day tour of the city’s most spectacular sights. Accompanied by a private guide, explore the innovative commercial area of Hongqiao Market in search of precious pearls and immerse yourself in the sacred wonder of the UNESCO World Heritage-listed Temple of Heaven. Marvel at the color and choreography of a ‘Legend of Kung Fu’ spectacular then pleasure your palate with a delicious dinner of Peking roast duck. Enjoy convenient round-trip transportation on this exhilarating private tour of Beijing. Zip across the country on a high-speed bullet train for a private 2-night tour of Shandong, including accommodation in Qufu and either round-trip transport from Beijing or on-ward transport to Shanghai. Discover Shandong’s rich spiritual heritage as you explore UNESCO-listed wonders like the Temple of Confucius, the Cemetery of Confucius and the Kong Family Mansion. Then, ride a cable car to the sacred peak of Mt Tai (Tai Shan), one of China’s Five Great Mountains, and soak up the views from the South Heaven Gate, White Cloud Cave and Sun Viewing Peak.